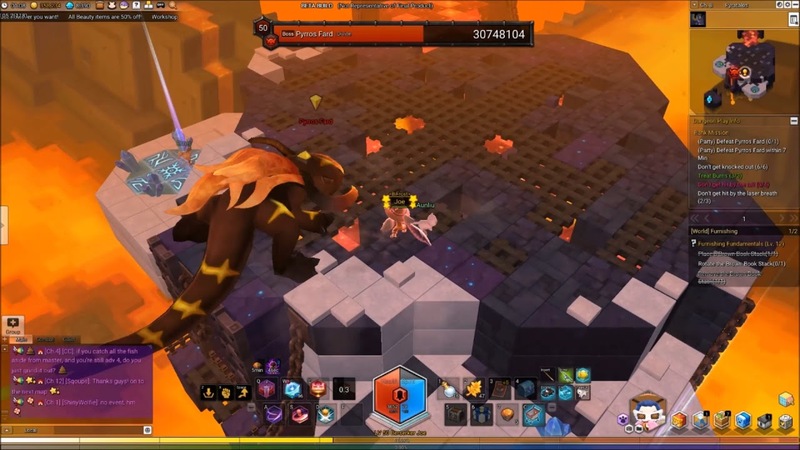 It’s difficult to go solo on dungeons in MapleStory 2, but it’s definitely doable regardless of your job. That, by all means, includes the Assassin. And we’re not just talking about Normal Mode dungeons here, mind you. This is a Hard Mode dungeon – we’re talking about Fire Dragon. Before an assassin can take on a Hard Mode dungeon boss, you need to give it the proper build and gear first. For your gear, make sure to have the following stats for each kind. For weapons, prioritize Piercing and then have Physical Attack, Total Damage, and Physical Piercing. As for headgear, suit, top, and bottom. Make sure to have Boss Damage then Physical Attack. Gloves should also prioritize Boss Damage, but instead, choose Physical Piercing as secondary. Another one that should have Boss damage is shoes. And lastly, for your cape, belt, and earring or amulet, go with Piercing, and then Boss Damage or Critical Rate if you can’t find any. These gear are worth a lot of MapleStory 2 Mesos, so be ready to dish them out. As for builds, there are three you can choose from. From their names, you should be able to tell what their core skills are. The first is the Lucky Stars, Star Chaser, and Star Flurry build. What sets this build apart is that it’s so efficient that you can use it even when you’re somewhat lacking in terms of gear. On the other hand, there is the Shadow Cutter build, which, unlike the former, doles out higher single-target damage. Its flaw, however, is that you can’t macro for it. Last, but definitely not least, is the Assassin Mirror Image build. Other than the namesake skill, Shadow Burst and Soul Grind will be your core skills. Bear in mind that this is a high skill cap build, so be ready to truly play the best way you can. Having discussed what you need to make an assassin who can singlehandedly kill the Fire Dragon, let’s move on to exactly how you’ll be able to take it down. Before heading to the dungeon, there are two things you need to make sure of. First, that you bring a pet that does auto-potions so you can spend your time dealing damage instead of healing. Second, that your settings are lag-free. If a single millisecond of lag can cost you a run with a team, the same goes when you go solo. As the raid begins, you’ll be able to find ledges. Use them to evade a good number of his attacks. Aside from a way to avoid getting damaged, stepping on the blue parts of the ledge removes the burn status effect. You can also use the ledge when the Fire Dragon tries to hit you with his tail. But if that isn’t possible at the moment, you can either run or even grab onto him. If he fails to hit you with the tail, he’ll use a large-radius attack in three quick successions. Don’t you worry though; it’s quite easy to dodge them. After that phase, he’ll start using his infamous rapid-fire breath attack, which he uses one after another. Once again, you can use the ledges to ensure you don’t get damaged. When he’s finally done, you can approach him again and resume attacking. When you do so, be careful with the leftover flames as they can be quite painful. At the end of the first phase, he’ll be combining his regular attacks with breath attack and AOE stun attacks. It’s easy to not get hit by both, so no worries there! This is true even with the latter, as the Fire Dragon doesn’t follow up after that. Upon whittling his HP, he’ll use a one-shot laser attack. Thankfully, it’s telegraphed and therefore easy to dodge. Finally, there’s the second part, which begins once his HP is down to 20 million. Aside from the fire breath and fireballs– which can’t be dodged, so be ready–he’ll do pretty much the same attacks. That should be easy enough for you since you know the rhythm now. With the right gear, build, skills, and knowledge, the assassin can be alone dragon slayer.